NetherRealm Studios’ superhero fighter Injustice: Gods Among Us has done very well, both critically and commercially, since it launched in early April, so it’s no surprise that the company announced a new DLC character would join the fray at this month’s Evolution Championship Series. 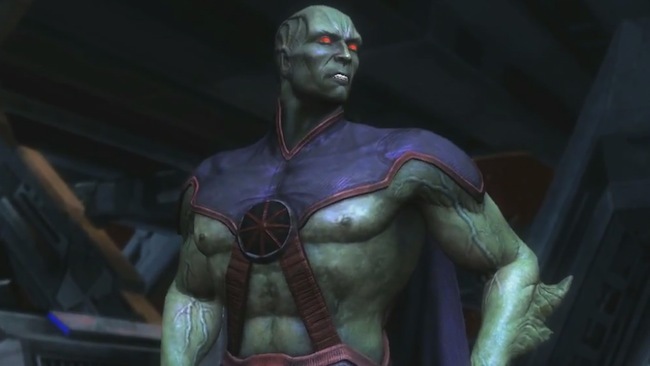 That character, the otherworldly Martian Manhunter, will release next week for the Xbox 360 and PlayStation 3, according to the game’s UK Facebook page. He’ll be made available on July 30 for those platforms. No mention was made of the Wii U version of the game. The character – the first not to be included as part of the game’s Season Pass – will retail $5, or 400 Microsoft Points. This won’t technically be the character’s first appearance in the game – he shows up as an easter egg in the background of the Justice League Watchtower stage. In DC Comics lore, J’onn J’onzz is the last surviving member of the Martian race, stranded on Earth by a scientist’s experiments. J’onzz adopts the identity of a human – John Jones – and fights crime by day as a police detective and by night as the superheroic Martian Manhunter. The character has appeared in most incarnations of the Justice League, both in comics and other media (perhaps most notably the Cartoon Network Justice League cartoons of the early-2000s). The character’s power set is similar to Superman, with many of the same powers represented – super strength, flight and x-ray vision, for example. There are a few differences like intangibility, shapeshifting, telepathy and an extreme weakness against fire, however. What do you think, Injustice fans? Are you excited for the Martian Manhunter to join the fray next week? Why or why not? Let us know in the comments.